With the dismantling of the old email program we lost the archery division membership list (some 120 members) we NEED your help to build this list up again. Please provide your Email Address, as well as, your First and Last Name to aid in re-establishing our divisional list. Also please let us know if you plan to attend the meeting. What do you as members want from the archery division? Your input is important to ensure the Archery Division is meeting the needs of all our members. Please come out and join in the conversation. Please join us at our first Archery Meeting of the 2019 year on Thursday January 17, 2019 held in the ready room at the Nanaimo Fish and Game Club. This meeting is a Meet and Greet, as well as, discussions with regards to the upcoming Archery season. Hello Club Members. We have had to close all the club facilities twice now because of storms causing trees to come down across the road into the club and on other places on the property. The road is now clear and you can get into the property. Individual ranges may close temporarily – such as the rifle range which currently has two trees that have fallen down from the berm in front of the 200 yard target line. These will be cleared as soon as possible. More storms are supposed to roll in so we may have to close again. With power outages everywhere we may not be able to post these closures right away so be patient and prepared for unexpected closures. A precedent-setting B.C. Supreme Court decision has ruled that the public should be able to access fishing lakes near Merritt, B.C., after years of what has been described as a “David and Goliath” legal battle. For years, the Douglas Lake Cattle Company (DLCC), the largest working ranch in Canada, owned by U.S. billionaire Stan Kroenke, and a group of determined anglers have been going head to head. Their dispute centred primarily on access to two fishing lakes and a road. Minnie Lake and Stoney Lake are surrounded by land owned by the large ranch, which claimed the access roads, water bodies and fish in them are private property. Members of the Nicola Valley Fish and Game club argued the lakes and roadway are Crown land and should be free for anyone to use. In a lengthy decision released Friday, which cited historical documents, photos, and testimony from members of the Indigenous community, B.C. Supreme Court Justice Joel Groves determined that both lakes are public. “It would be nonsensical for a government to retain the rights to a lake if, by virtue of a single owner purchasing all the land surrounding a lake, that owner could prohibit public use or ownership of the lake,” wrote Groves. Westwood Lake Fishing Float Refurbishment. In the spring, the Nanaimo Fish and Game was contacted by Jean Chandler with regards to refurbishing the fishing float at Westwood Lake. The lake was a favourite spot of Mrs. Chandler’s son, who had passed away a few years earlier, and her thought was to provide partial funding to restore the float to its former glory in his memory. The Fish and Game had originally built the float over two decades ago for donation to the City and the enjoyment of the residents of Nanaimo and, as such, was more than happy to take on the project. Initial measurements were taken with the help of Steve Corscadden and, after some discussion, it was decided to replace the decking, benches and ramp with yellow cedar and pressure treated plywood with Duradek (donated by Greg Stevens) covering. On October 27th and 28th, John Noble, Ron and Mark Tuson, Doug Miller and myself put in roughly fifty hours of work and completed the project Sunday afternoon (wow 20’ 2”x8” boards are a lot heavier than they look!). Mrs. Chandler and her son Joel also pitched in and helped with site clean up, which was very much appreciated. Fortunately, the weather cooperated for the better part of both days and the crew got away with only a moderate soaking. With the restoration of the float complete, all those who enjoy Westwood Lake will have an excellent spot to take in the views and do a little fishing for decades to come. 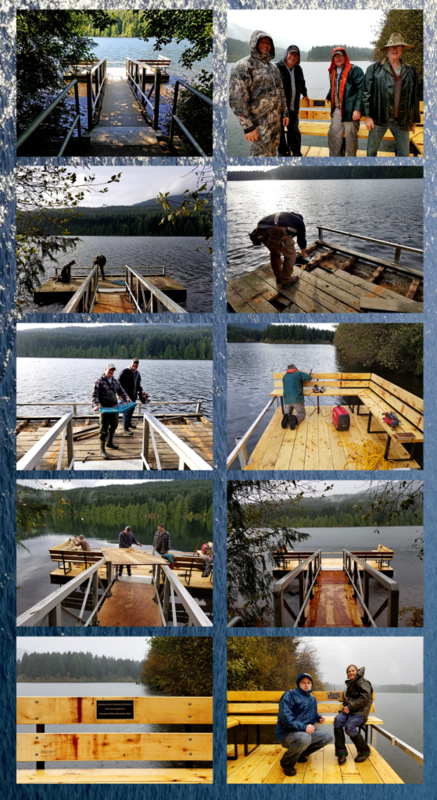 I would like to express my gratitude to your club and in particular to your volunteers: Chris McFarlane, John Noble, Ron Tuson, Mark Tuson, Doug Miller and others who participated in planning the fishing wharf replacement at Westwood Lake. My son, Luke Chandler passed away February 27, 2017 when his canoe flipped in the icy waters. He succumbed to the cold and was unable to right the canoe, jump back in, and return to shore. Although people on shore called for help, he drowned before there was help available to him. This accident was in the waters visible from the fishing wharf. This wharf is the place that I, my family, and many of Luke’s friends go to remember Luke. I contacted Chris who asked the executive if the club would be willing to split the cost of refurbishing the wharf with me. I proposed that I would replace the NFGPA plaque with one to match a memorial plaque for Luke. With Chris and the executive’s support, the club agreed to this plan. Chris worked with the city of Nanaimo and with other volunteers to determine the condition of the existing wharf parts and to develop a list of material requirements for the refurbishment. I’ve shared the plaque location and pictures with many of Luke’s friends and with family. Feedback has been tremendous. People noticed how new it looks without my telling them about the funding and work from your club. There is a Facebook site for memories of Luke that people continue to share thoughts and memories of Luke. I’ll be putting a link on it to your website so that Luke’s friends and family can see Chris McFarlane’s write up on the NFGPA home page about the work on the dock. Moose Hunting Regulations for the North Part of the Skeena Region. CLICK HERE to see a brochure that was developed to help hunters interpret the moose hunting regulations for the north part of the Skeena Region. It was designed to be printed and folded into a 3-sided brochure. The summary of the northern moose regulations on page 71 of Hunting and Trapping Synopsis covers the new regulations, however this brochure is more comprehensive. The brochure will also be posted online in the next few days. National Post View: The Liberals Consultation with Canadians about banning handguns is pointless pretending. There’s no need for a major overhaul of our gun laws, and there are far less draconian and faster ways to tackle any concern over lawful guns being sold onto the black market. 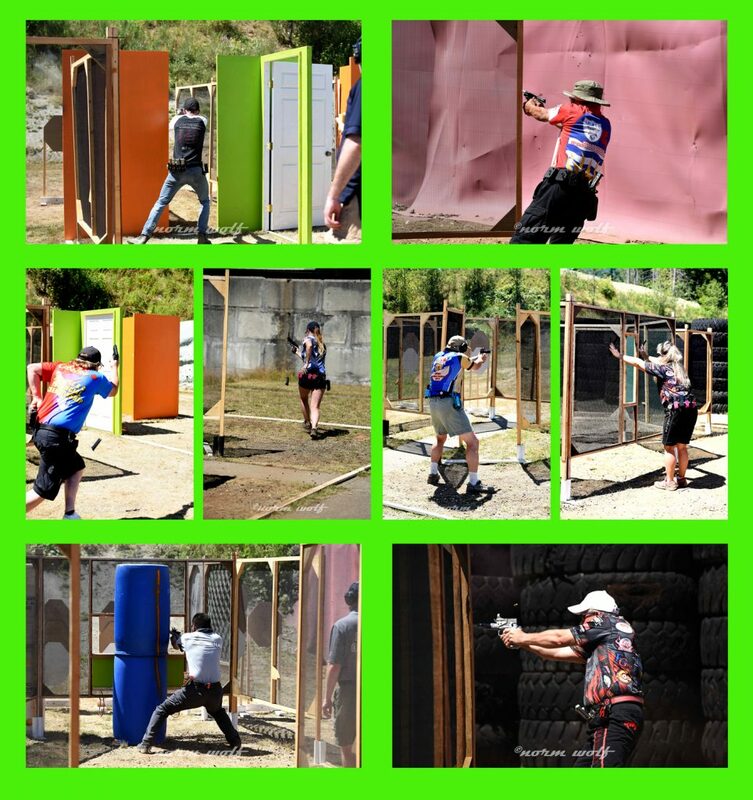 On July 14th and 15th, Nanaimo Fish & Game hosted our annual IPSC BC double qualifier, two separate matches held on consecutive days. More than 100 shooters from all over the province (and one from Grand Cayman Islands!) braved the scorching heat to come out and shoot seven stages (mini matches) consisting a total of 212 rounds each day. When the smoke cleared and the computer finished crunching the numbers, the winners were announced. Sundays course of fire was a variation of Saturdays. Same number of stages and rounds, different start positions. There were a few different shooters and a few less shooters. The heat was taking its toll. On behalf of myself and the rest of the match committee (Kevin Wheatcroft, Jurgen Brandmeier and Rob Clarke), I would like to thank everyone who came out and shot the match, our helpers for set-up and tear-down and congratulate all of the division and class winners. We’re looking forward to doing this all over again next year. I would also like to thank Norm Wolf who came out and photographed the event for us. CLICK HERE to see the winners.